July 10, 2011 Automatic pet food dispensers have increased in quality tremendously since the first ones were released a decade ago. Jamming of the dispenser and other annoying problems are now a thing of the past. Newer automatic pet food dispensers have anti-jamming technology to ensure your dog or cat gets their food on time. 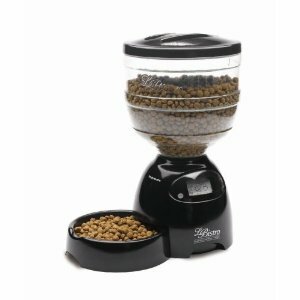 The major advantage of having an automatic pet food dispenser is that you can schedule when and how often your pet eats. Another major advantage is portion control. We all know overweight pets are becoming an epidemic, and portion control is another big advantage. If you are buying an automatic dog food dispenser be sure to look for one with a heavy base so your pet does not tip it over. Also look for ones that have a locking lid so your pet cannot break into it. Anti-jamming technology is another feature to look for. Its very easy for a small piece of dog kibble to get stuck in a hopper dispensing door and jam up the whole machine. Other things to think about include your budget, holding container size, and how easy it is to program feedings. This is the best seller because it has a huge 45 cup capacity. You can also program it to feed from as little as 1/4 cup to 2 1/2 cups. Feedings can be programmed from one to four per day. It also features an anti-jamming hopper, and a speaker so you can leave a personalized message for your pet that they will hear at each feeding. The Lentek 6 Day Automatic Pet Dish is the number 2 best seller right now. Each food compartment holds 2/3 cup of food. Feeding intervals can be set at 6, 12, or 24 hours. The PetMate Le Bistro comes in a 5 or 10 pound feeder size. You can feed anywhere from 1/4 to 2 cups at a time, up to 3 times per day. The bowl is easy to clean and dishwasher safe. Lastly, if you are going to use an automatic pet food dispenser for the first time, be sure to thoroughly test it out before you actually go on vacation. This ensure that you have properly programmed the machine. Even though you have this machine, it's still a good idea to have someone check on your pet daily.